Can you believe there are only 3 days left to order from the 2016-2017 Annual Stampin' Up! Catalogue?! Be sure to check out the retiring products before it's too late. 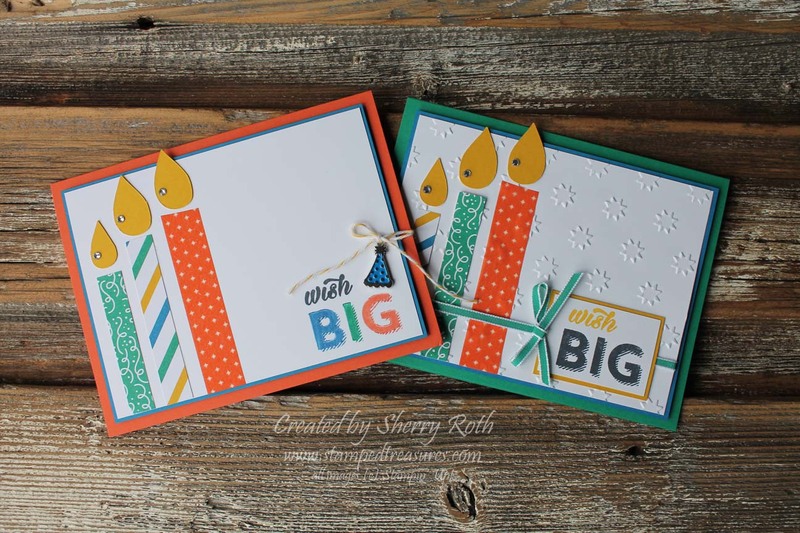 A client contacted me last week asking if I could make her a bunch of birthday cards to replenish her stash (she's not a stamper). She had seen a card on Pinterest that she really liked and asked me if I could make something similar. Of course I agreed! These two cards are what I came up with. I used the Birthday Bright stamp set from the Occasions catalogue (on sale $22.10). I love this stamp set, the photo of the set in the occasions catalogue doesn't do it justice. As a matter of fact, I bet most people miss it because it's kind of in the lower corner of the page and is pictured quite small. 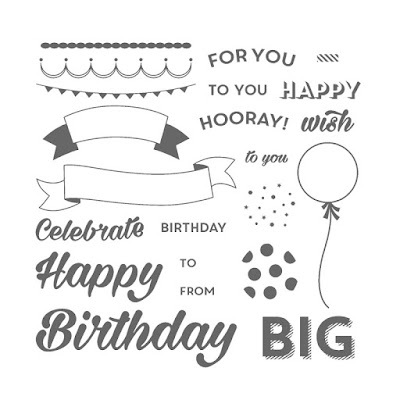 It's got a nice variety of fonts, some great borders, banners and a cute balloon that you can dress up with polka dots! I love it! When she said she wanted the card to be generic (for boys/girls/men or women), I knew exactly which dsp I was going to use - the Party Animal DSP (on sale for $8.70). 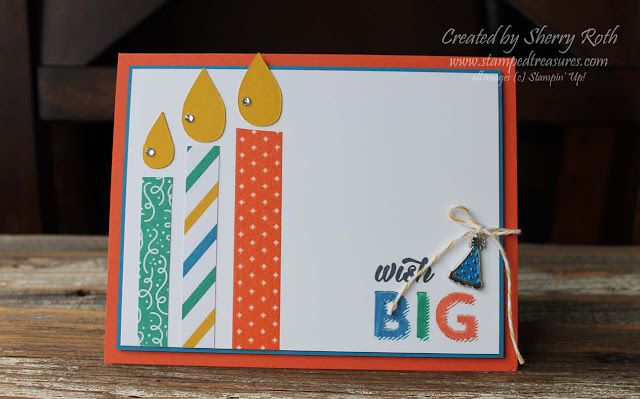 Two of the candles are cut from the dsp and the third (the tangerine one) is one of the washi tapes from the Party Animal washi tape package (on sale for $7.53). Initially I didn't have the little party hat on there but I think it adds so much - I had to include it:) - it's from the Party Animal Embellishments (on sale for $5.55). 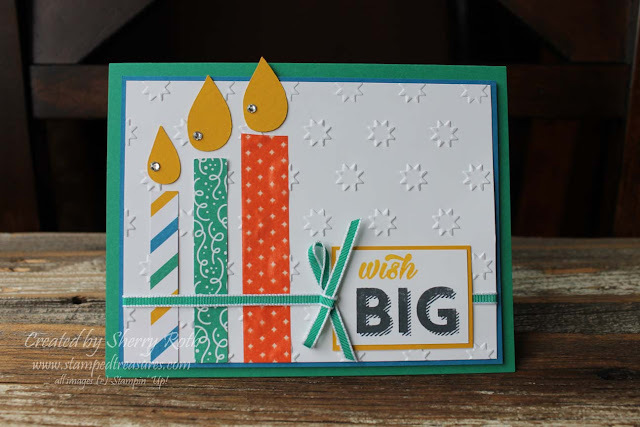 For the second option, I kept the same design but added some Emerald Envy 1/8" ribbon (on sale for $4.80) and embossed the white background using a new embossing folder called Oh My Stars (available June 1st). These cards were so easy to create and now she's got herself covered for a few months worth of birthdays! Note: Oh My Stars embossing folder will be available to order June 1st. Rhinestones are sold out at the moment but we will have rhinestones available on June 1st.